Eustacio "Tacho" C. Soliz, 85, took his final "Viaje" trip home on Tuesday, March 26, 2019 to be welcomed with open arms by his parents and all of his siblings. He was as we like to say "The Last of the Mohicans". He was born on Wednesday, March 29, 1933 in Nordheim, Texas to Juan Soliz and Saturnina Castro Soliz. 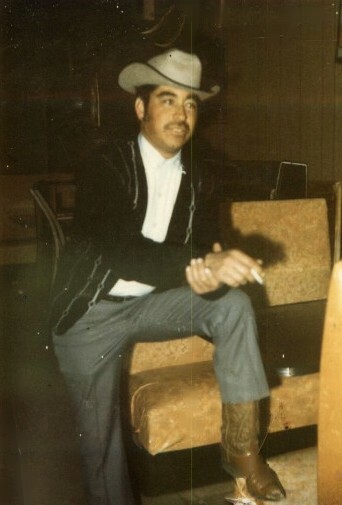 Tacho is survived by his loving wife of 54 years; Rosalia R. Soliz, sons; Samuel (Elma) Soliz, Sr. and Juan Manuel (Sandra) Soliz, daughters; Janie Soliz, Esmer "Molly" (Ruben) Rios and Ronnie (Lanay) Soliz, 10 - grandchildren, 2 - great grandchildren, numerous nieces and nephews. Eustacio was known by several names. Some knew him as Tacho, Soliz, or his truck handle; EZ. He was a truck driver for almost 50 years until his retirement. In his spare time he enjoyed reading the newspaper, especially the obituary section, or working on his word search books, or watching "Tombstone" and boxing anytime there was a fight. He also enjoyed fishing, making picnic tables, and fixing things that just needed a little duct tape. As his heavenly family is receiving him joyously, we want him to rest assure that we will always be watching our speed. He will be greatly missed by his family, friends and all those whose lives he touched. His family will receive friends today, Thursday, March 28, 2019 from 5:00 PM - 9:00 PM with a Rosary to be prayed at 7:00 PM in the Chapel of Peace at Ceballos-Diaz Funeral Home, 322 East Kuhn Street in Edinburg. Catholic Mass will be celebrated on his 86th Birthday on Friday, March 29, 2019 at 10:00 AM at Sacred Heart Catholic Church, 501 East Kuhn Street in Edinburg. Catholic burial will follow to Hillcrest Memorial Park Cemetery, 1701 East Richardson Road. Having the distinguished honor to serve as pallbearers will be: Samuel Soliz, Sr., Juan M. Soliz, Samuel Soliz, Jr., Ruben Rios, James Soliz, Joseph Soliz, and Walter Pineda. Funeral services have been entrusted to Johnny Garcia, Manager/Funeral Director and staff of Ceballos-Diaz Funeral Home.